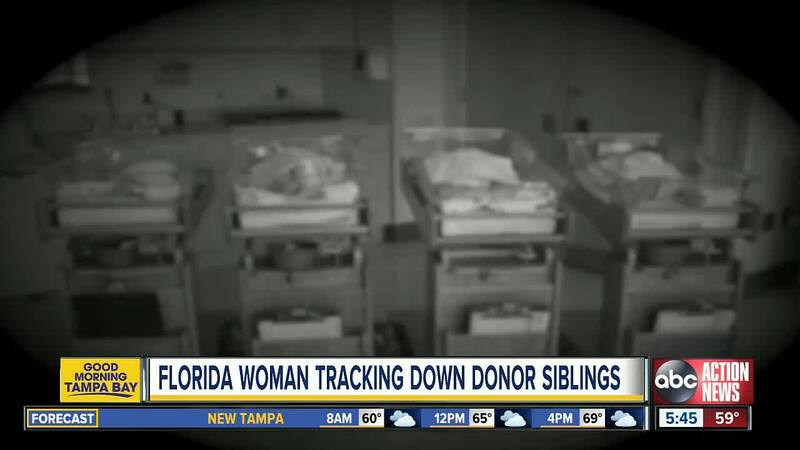 TAMPA, Florida — A sperm bank is promising to change its policy after WFTS television station uncovered one of its donors fathered more than 50 children across the U.S. and around the world — including some kids in the Tampa Bay area. Atlanta-based Xytex Cryo International did nothing illegal when it used the same donor to help birth at least 52 children. That’s because when it comes to sperm donations, U.S. regulations are few and there are no limits set by the government. Xytex wouldn’t speak on camera but told WFTS Reporter Andrea Lyon the company doesn’t have accurate information on how many babies are born from each donor because it relies on parents and clinics to self-report. Arroyo grew up as an only child with her two moms in Orlando and has known since she was a young girl that her biological father was a sperm donor, but when she turned 18, she grew curious about her donor dad. Since then, Arroyo has uncovered dozens of half brothers and sisters through searches on social media and the Donor Sibling Registry. “Some pictures started showing up of, ‘Oh yeah this is your brother. This is your sister,’” said Arroyo. As of this month, Arroyo has tracked down 52 siblings – including seven in Florida. The list also counts siblings in Australia, New Zealand and Canada – where the youngest is just one-year-old. “It’s an overwhelming number for sure,” said Arroyo. After WFTS contacted Xytex about this case, the company pledged to change its policy – limiting each donor to 15 families in the U.S. and another 25 families worldwide. Previously, Xytex had no cap on the number of kids born in the U.S. to a single donor and allowed an additional 40 international families to also use the same donor. Arroyo said she’s excited to learn she’s a big sister to the siblings she calls “little ducklings,” and is recording her quest to find all her half brothers and sisters on Instagram. But not all of Arroyo’s siblings feel the same way. “It’s not that great to say that I am a part of a donor family,” said Alana Alaia. Alana and her twin sister Joanna of Tampa are Arroyo’s half-sisters. Alana, speaking for the first time publicly about being part of a donor family, told WFTS she wants to see limits on the number of children born to a single donor. ABC Action News found that other countries, such as China, Spain, Hong Kong, Taiwan and France, only allow a handful of births per a single donor. A fertility expert at University of South Florida told WFTS it’s unlikely that siblings born from the same donor would end up dating – or even marrying. The American Society of Reproductive Medicine estimates the chances of donor siblings meeting are low — as long as there aren’t more than 25 donor siblings born in an area with a population under 850,000. But social media is making it easier to find donor siblings. Arroyo said she was also able to find and meet her biological father by searching his donor identification number on the Donor Sibling Registry. The donor father declined to speak with WFTS for this story. But Xytex said that donor began giving donations in the early 1990s and then briefly came back again to donate in the early 2000s. The company would not say whether it asked him to come back because he was a popular donor. While Arroyo is excited to get to know her new, big family, she also supports a cap on births per donor.